Three gold colored decorative bobby pins with plastic tips. 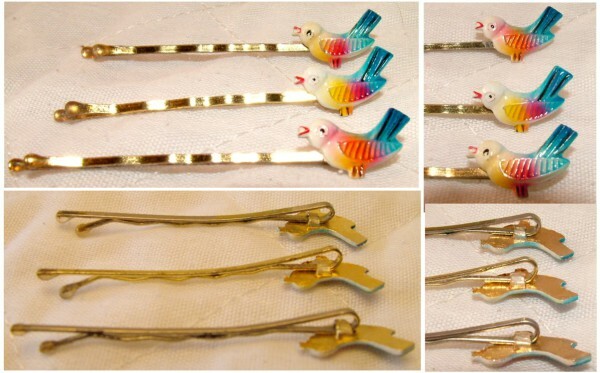 Birds have a gold metal backing with enamelled look, colored in yellow, red and blue. These pins are well over 30 years old. Five gold colored decorative bobby pins. 4 are short -about 1.5 inches long. Two are decorated with arrows, one has a diamond shape, one has a flower with rhinestone center. The last is about 1.75 inches long, and has a turtle decoration with a blue shell. The ends of the turtle bobby pin has plastic tips, the others do not. The arrow and diamond shaped pins show some wear. All of these pins are well over 30 years old.